Looks like Americans might have to find something else to smash on toast, because if Trump gets his way and shuts down the border, imports from Mexico will plummet. Nearly half of all the vegetables, and 40 per cent of the fruit the US imports, is grown in Mexico. 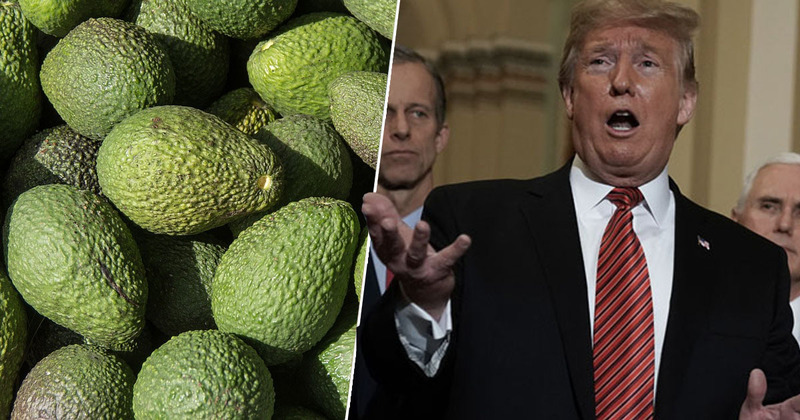 A lot of the country’s alcohol is imported from Mexico too, meaning tequila and lime may be in short supply, while stocks of those sweet avos, along with produce like tomatoes, cucumbers, blackberries and raspberries, will be down too. This is according to the latest data from the United States Department of Agriculture, who said supplies would run out in three weeks if imports from Mexico were stopped. You couldn’t pick a worse time of year because Mexico supplies virtually 100% of the avocados in the US right now. California is just starting and they have a very small crop, but they’re not relevant right now and won’t be for another month or so. While it’s always been one of Trump’s aims to build a wall along the US-Mexico border, the president said on Friday, March 29, there was a ‘very good likelihood’ he would close the border this week if authorities did not stop immigrants reaching the US. A complete shutdown of the border would be nothing short of chaotic for both countries, disrupting millions of legal border crossings and asylum seekers, as well as impacting the significant trade. Around $137 billion of trade between the countries is food. When a border is closed or barriers to trade are put in place, I absolutely expect there would be an impact on consumers. We’re absolutely going to see higher prices. This is a very real and very relevant concern for American consumers. Mexico’s exports wouldn’t just be affected, as the country is also the largest importer of US exports of refined fuels, such as diesel and gasoline. Much of this is transported by rail however, and as yet it’s unclear whether the railways would be affected by the shutdown. Since 1999, imports to the US from Mexico have nearly tripled, with Mexico now supplying around 44 per cent of America’s imported produce. Although prices in supermarkets are yet to be affected, it’s the food companies who are already feeling the sting if the worst case scenario happens. As Barnard added: ‘We would be out of business for a while’.